The Anderson County Sheriff's Office has arrested two men on separate cases of sexually abusing children. Oak Ridge police took a California man into custody after he attempted to enter a building adjacent to Y-12 on Friday night. An employee of the New Hope Center confronted Rishi Chatterjee Malakar, 24, as he was attempting to get into the building through a back door. Police said Malakar demanded a tour of the building. When the employee said no, Malakar apparently took off in a maroon-colored Jeep with a Texas license plate. 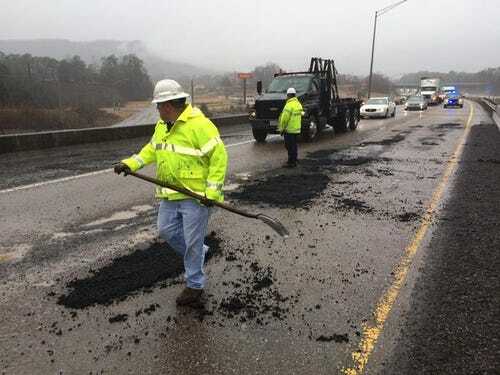 I-75 S. potholes pop tires on 20 vehicles in Anderson Co.
A local club partnered with a non-profit to give the gift of sight to an East Tennessee community. Lions Club teamed up with Remote Area Medical Clinic to give free eye exams and frame fitting to people at a senior-living facility in Clinton. The club has been behind this effort for the past 18 months, giving away almost 700 pairs of eyeglasses. Ron Reihn, Lions Club coordinator, said without the clinic, the people they serve wouldn't get this type of care. (WBIR) Crews responded Saturday night to a partial roof collapse at an Anderson County packaging company. Andersonville fire officials said it happened around 7:45 p.m. at Pharma Packaging Solutions on First Quality Drive in Norris. A small gas leak happened during the collapse, but it was quickly contained. (WBIR - Anderson County) Two zebras at the Little Ponderosa Zoo narrowly avoided injury Saturday after their home collapsed following a winter storm. Two caretakers came to feed them so the animals walked out from underneath the shelter. Then, the building collapsed underneath the weight of the snow and rain, according to the non-profit zoo and rescue organization. Council votes to investigate Oak Ridge Police Dept.